Direct and current finance information is the basis for trustworthy communication with stockholders, investors and analysts. We provide comprehensive information about the NEXUS-Group from the viewpoint of the financial market as well as about NEXUS stocks on the following pages. You can also view our financial reports online and establish contact with our IR team. On the following pages you can get an overview on ad hoc announcements, financial news and voting rights notifications. With an increase in sales of 14.6 % and an improvement in EBIT of 14.0 %, we were able to show again in 2018 that we can grow dynamically and at the same time improve our results further. This is important to us: We want to continue to pursue the goals of growth and earnings improvement in parallel. Our customers also want us to combine innovation with a serious corporate development. The NEXUS stock is listed on the Frankfurt Stock Exchange. With the ad-hoc announcements of 25 October 2016 and 19 December 2011, the Executive Board of NEXUS AG published the resolution to make use of the empowerment of the respective general stockholders' meeting to purchase own shares of the company in line with Section 71 para. 1 no. 8 of the German Stock Corporation Law (AktG). The empowerment is restricted to the time period until 30 April 2020 and a scope of 10% of the equity capital. All transactions will be announced monthly at this website monthly after they have been effected. Further information on the stock buybacks of 31 October 2007 and 19 December 2011 read more.. 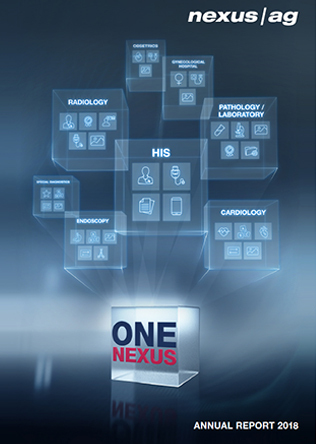 Responsible company management based on long-term creation of value plays an important role at NEXUS. Corporate Governance is not a rigid system in our company, but instead a continual process in which value and principles are developed further in line with current requirements. The NEXUS Group thanks you for visiting this website and for your interest in the products. These Internet pages and the news published therein constitute neither an offer to sell nor an invitation to buy securities, nor an invitation to submit such an offer. These Internet pages and the information contained therein may only be distributed or otherwise used in accordance with the applicable (securities) regulations. Specifically, distribution in the United States of America (USA), Japan or Canada or to persons (including legal persons) subject to the relevant (securities) restrictions of such countries and to publications with a general distribution in those countries is prohibited. You can subscribe to financial reports of NEXUS AG here. As a result, you will receive business and quarterly reports promptly by email.